Breeanna Taylor bikes 12 miles down the Imperial Highway to get to work. 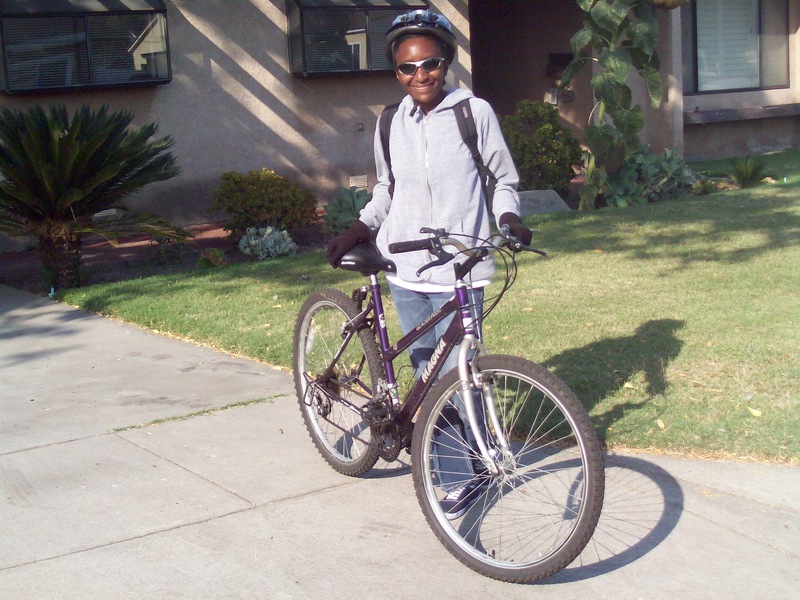 Breeanna with her mountain bike, helmet, and sunglasses, ready to bike to work. Photo courtesy of Breeanna Taylor. She gives us her tips on bicycling to work and tells us about handling “steep hills and scary car situations” in an interview after the jump. Why do you take Imperial Highway? Why did you start bicycling to work? What has kept you riding for the last one and a half years? Have you had any memorable experiences while biking to work? She rides a 12-speed mountain bike – the gears help her climb the hills in her neighborhood. Whenever possible, she bikes on roads that have wide lanes and less car traffic. She uses Google Maps’ “bicycle” feature to plan her commute. Her flexible work schedule allows her to take a break from commuting once or twice during the week. Thanks Breeanna for being a bicycling inspiration! With help from our generous Bike Week sponsors, we’ve sent you a Nathan safety vest, RydeSafe reflective decals, Clif Bars, and a free year of bicycle roadside assistance from Better World Club. I’m considering riding from La Mirada to Downey for my work commute. All of it on Imperial Hwy. Question: Do you ride in the street the whole way? Or on the sidewalk and the street? It’s a very congested and dangerous highway. Good for you Breeanna. I’m glad for you. One thing you might consider is trying a rear view mirror attached to your sunglasses. It may or may not appeal to you but I like the option of a wide view of what’s coming up behind me when I’m in traffic. I use one called “Take a Look”. There’s others on the market. In any event, hopefully others will be encouraged by your example. Ride On. Wow! How athletic. Keep up the great work. Go girl! keep on ridin! Oh my little Breeanna, you are an inspiration to many 🙂 Thank you for sending me your link so I could read this. I am so proud of you and hope to see you soon!!! Love you, continue to be safe, and God bless.